Many Glovius users are from Purchasing and Should Costing teams. Product designers need to identify unproductive manufacturing costs early in the product life cycle. Designers and Program Planners are faced with stringent cost targets as companies optimize to provide maximum product value. Should-Cost analysis helps in these scenarios and empowers product manufacturers to break down costs analytically and iterate based on the cost structure. According to some estimates, conducting Should Costing reviews can reduce the cost of total systems by 5 to 15 percent and sub systems cost by up to 40 percent! 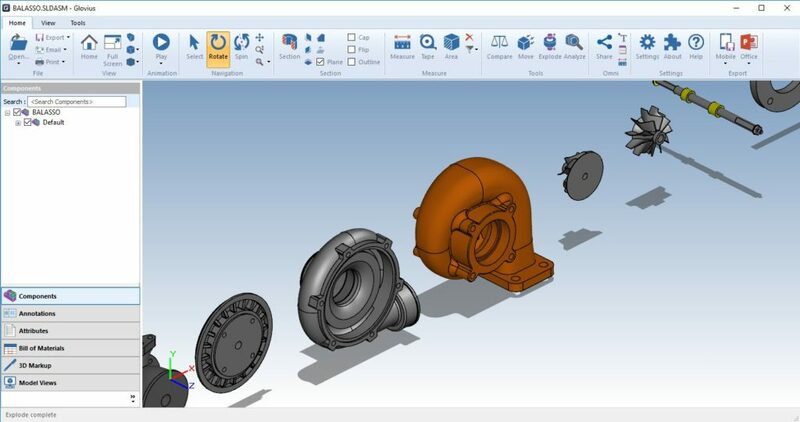 Glovius offers a number of tools to help calculate the cost of manufacturing of a component. 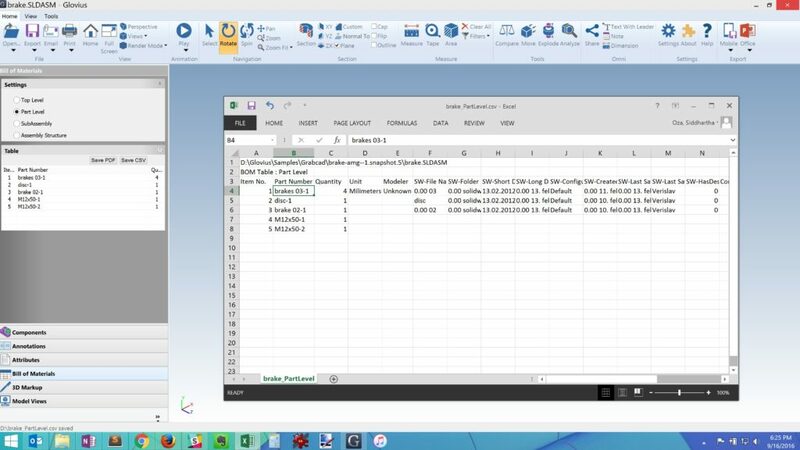 Generate a part level Bill of Materials report in CSV format and import it in Microsoft Excel. The report contains the dimensions of the component, quantity, material (if specified) and serves as a start point for your Should-Cost calculations. For parts, use the Analyse dialog to instantly get the component bounds, mass properties and other relevant information. 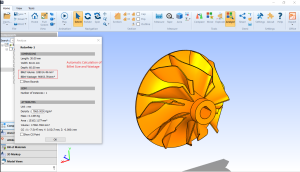 If you receive an iteration of a previous component – use the Compare tool and find the differences in 3D design to calculate the delta value in cost accordingly. Use the measure tool to better understand the changes. You can also save the comparison results in PDF for sharing and collaboration. Use the Component Visibility tools from the View tab to focus on a specific component. You can Select and Isolate any component for a clear understanding of its design. We hope this post gets you started on Should Costing analysis for your components. Please contact us at support@glovius.com if you have any feedback, questions or suggestions. Glovius 4.4 is available for download. In this release, we have added bunch of new features and squashed many bugs. Glovius now has a refreshed UI, Explode tool, ability to Measure during Sectioning and a new way to share mark-ups and collaborate faster with your team. 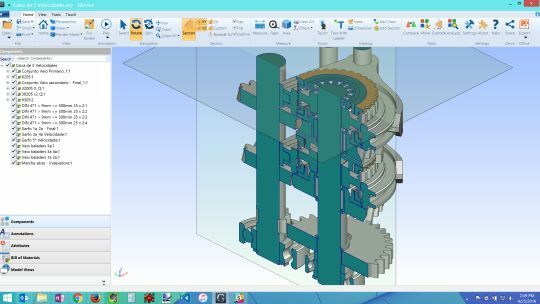 View parts and assemblies created in CATIA V5-6 2016 and Inventor 2017 with Glovius for Windows Release 4.4. New icons and a refreshed ribbon bar layout. Sometimes, you need a lower or higher precision during measurement and BOM reports. You can now set the number of decimal places based on your requirement. 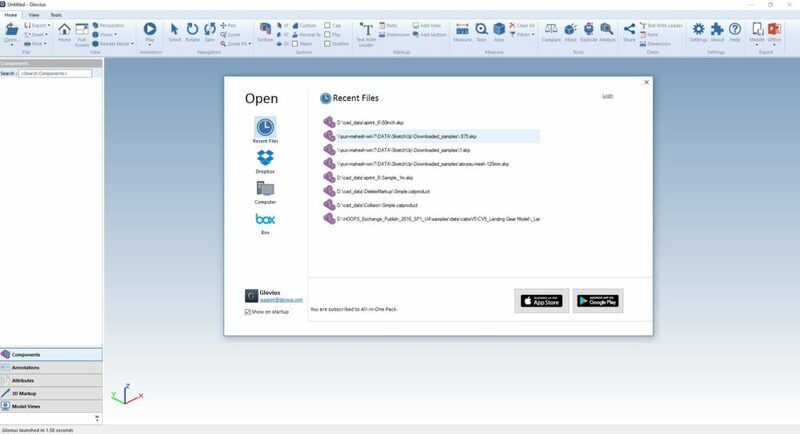 Many of Glovius customers use Dropbox and Box for storing CAD files in the cloud. You can now directly open your 3D models from Dropbox and Box from the File > Open dialog. Sectioning is one of our top features in Glovius. However, most of our users want to section and measure components at the same time. 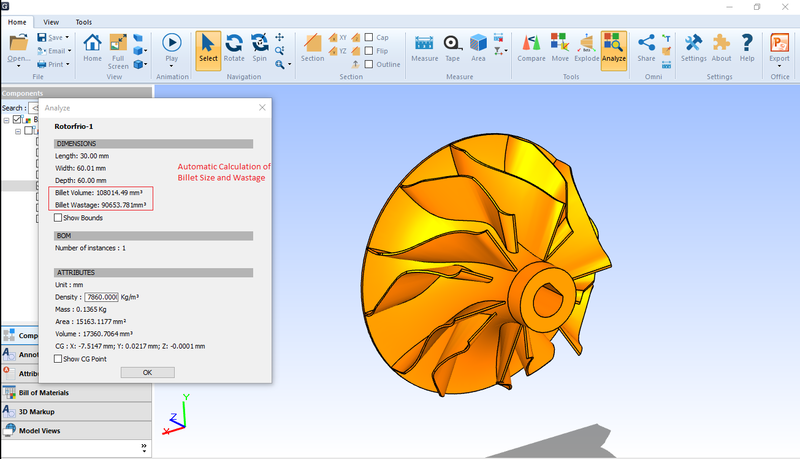 Now you can cut sections and measure by turning off the plane and measure the components. Explosion helps us understand assembly structure and gives us a peek inside the component architecture. We have rewritten and improved “Explode” in Glovius. It uses the Product Structure and Coordinate axes to explode components. We have made it simpler to share design review comments and notes with your team. 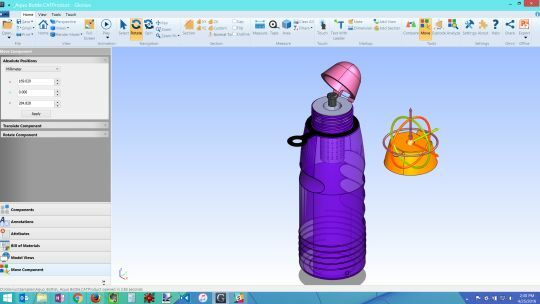 Open a CAD model, add markup and share just the COLLAB file. When your team member opens the CAD model and the COLLAB file, Glovius loads all the markups and notes contained within. Glovius for Windows Release 4.4 is now available for download. 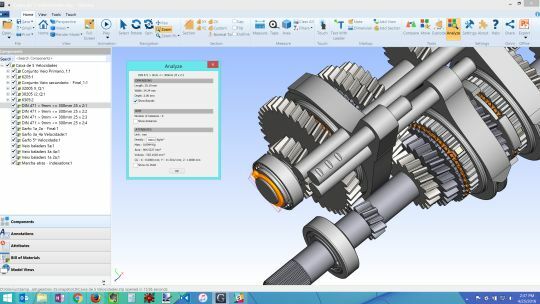 Register and download a free 7-day trial to view, measure, section, markup and compare 3D models from popular CAD formats like CATIA V5 and V6, NX, Pro/ENGINEER and Creo, SolidWorks, Inventor, Solid Edge, STEP, IGES and more. Subscription customers can upgrade to the new release immediately. License customers who have purchased Glovius after August, 2015 can upgrade to the new release free of charge. Please contact us at support@glovius.com if you have any questions. 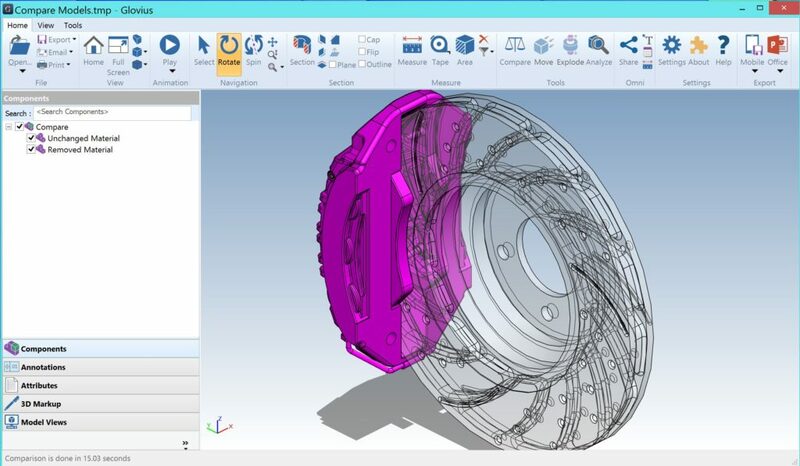 Glovius has number of tools to quickly calculate and surface meta data associated with the CAD components. We recently introduced a new parameter to calculate the billet size needed to manufacture the component and the corresponding wastage of raw material in subsequent manufacturing steps. Do try it out and let us know your feedback at support@glovius.com. Analyze Tool – This tool gives you a snapshot of the selected component. If you select a part for Analyze, an information dialog pops up with information such as the outline dimensions, number of similar instances in the assembly, Mass, Total surface area and Volume. You can also check for the Center of Gravity (CG) of the component to check whether it complies to your design intent. Explosion (in beta) – Designers follow various methods while assembling component. 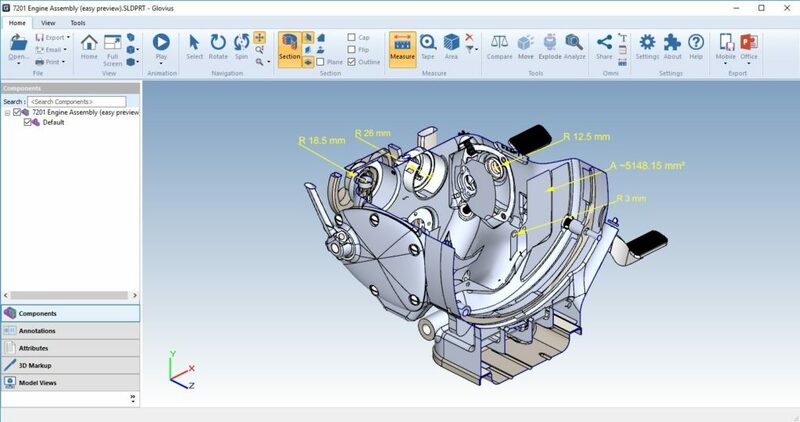 Though many CAD software provide In-Context assemblies, some designers prefer a bottoms-up approach while designing the component. In these situations, the Product Structure doesn’t necessarily reflect the integration steps for the assembly. Using the Explosion tool gives you a quick idea about the organization of the assembly. 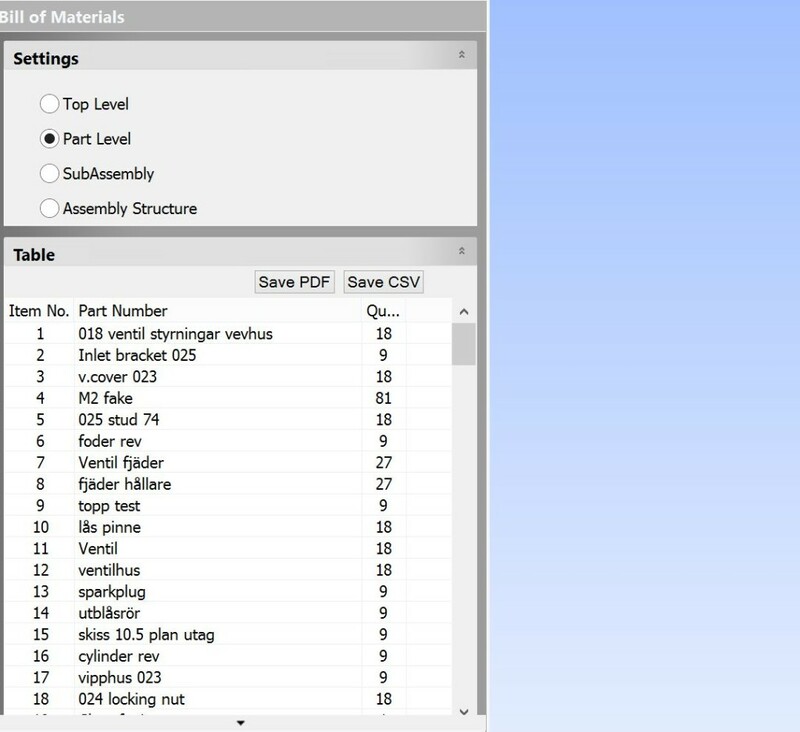 Bill of Materials – Bill of Materials is the bridge between CAD and actual product design. It reflects the components needed to assemble and create the final design. Thus at various stages of production, different types of BoM exist. You can create them either on the basis of assembly hierarchy or the product hierarchy. Use Glovius to generate BoM reports in PDF and Excel formats. We attach a image snapshot of the component in the PDF report for easy identification. Attributes can also be exported in the BoM report. Sections – Taking Sections of component gives you a quick way to check the internals of a component assembly. You can create sections at a plane or along any surface of the component. Click on multiple planes for more clarity. Move – Using the Move tool you can quickly declutter your component and focus on the essentials. Select a component and use the Move tool to quickly remove it from the view. Visit our support page to learn more about Glovius. For questions, feedback and feature requests, please drop me an email at sid@glovius.com.